As a kid, you always dream of meeting your favorite ball players. 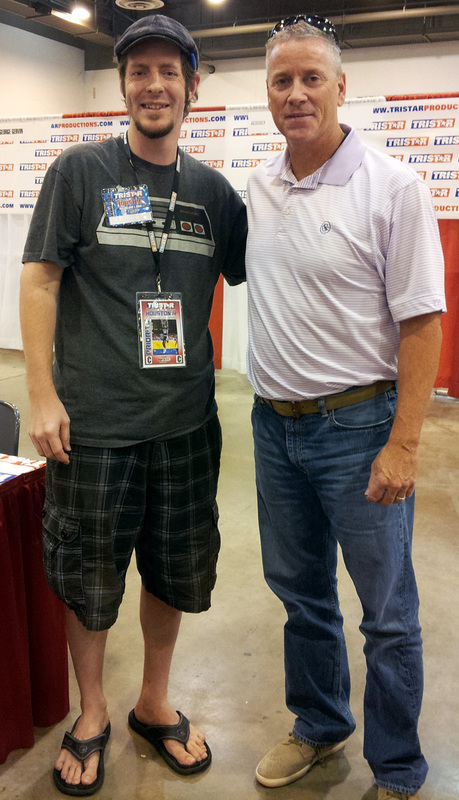 I was fortunate enough to have met Jose Canseco twice over the past two years. Whenever someone would go to a show, I would always think that the people who paid these big bucks to get autographs were … well … nuts! 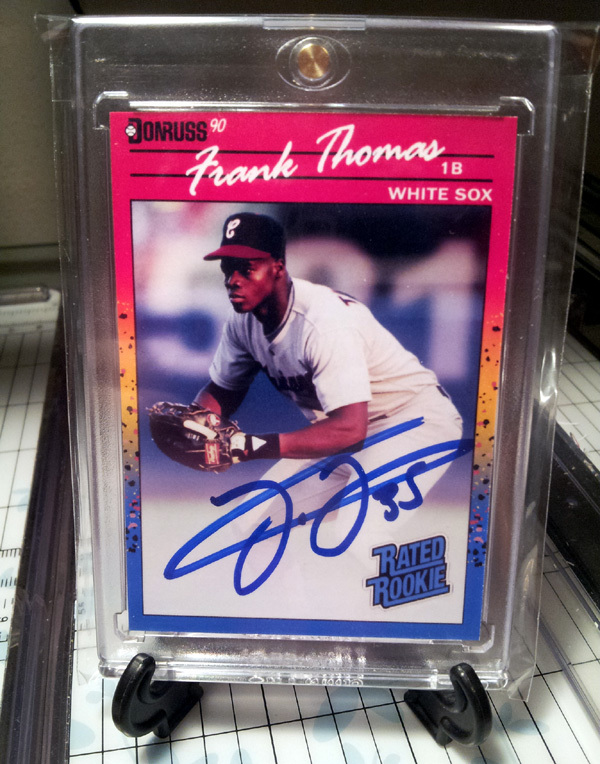 Why pay $100 on an autograph, when you could get them on ebay for half or less? As I have been creating custom cards over the past few months now, my eyes have been opened. What a rockin’ ice breaker to be able to talk to players and be able to give them one of your creations. I mean, honestly … it beats the heck out of them autographing a $215 jersey. If I’m paying to meet them, I want to do something special – something that I can give them and feel proud of. So, that is what I have been doing all week. If you were a blog follower of mine, you have probably already read – and saw the customs I was taking to the show. Only IF I was able to get some other takers. 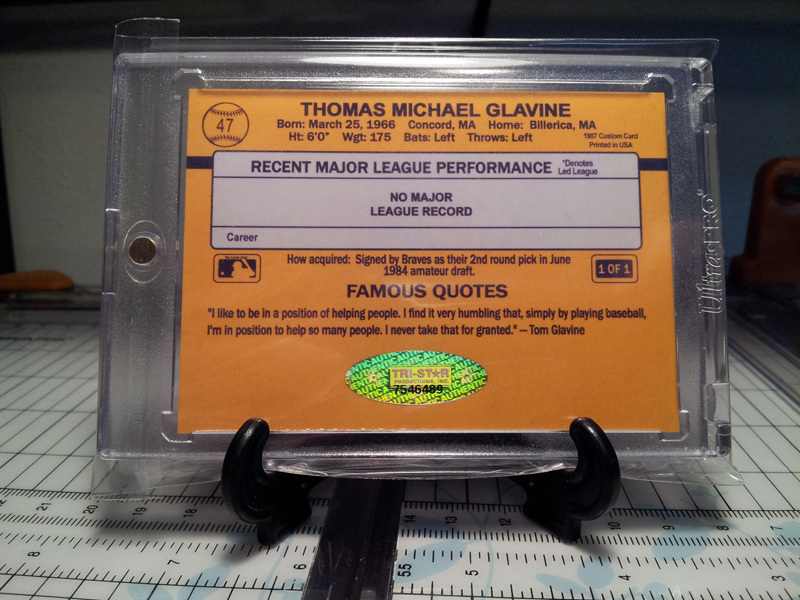 Originally, I was just going to try and sell my Glavine ticket to get Thomas, but that didn’t happen. 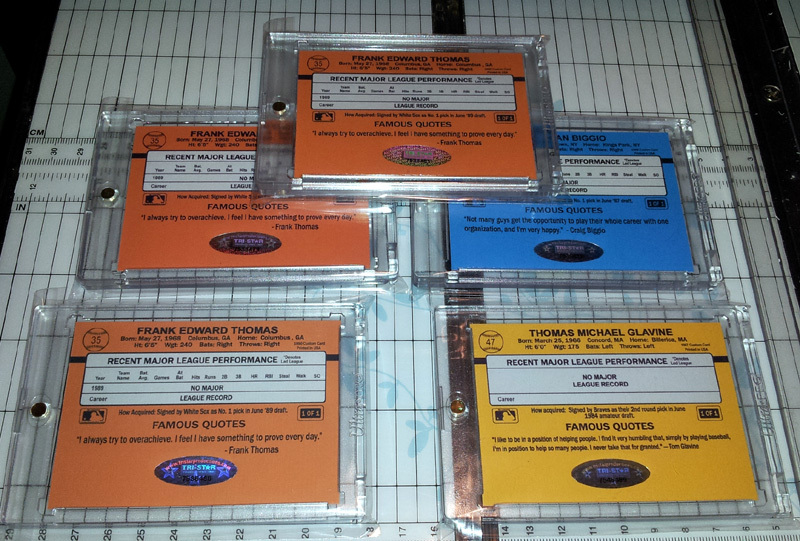 Instead, I had two people get Thomas, and it helped fund get all THREE of the guys I was wanting to see. I’m so glad I wrote the last article, because had that not happened, I wouldn’t have a great memory to hold onto for life. So, let’s start from the beginning, shall we? 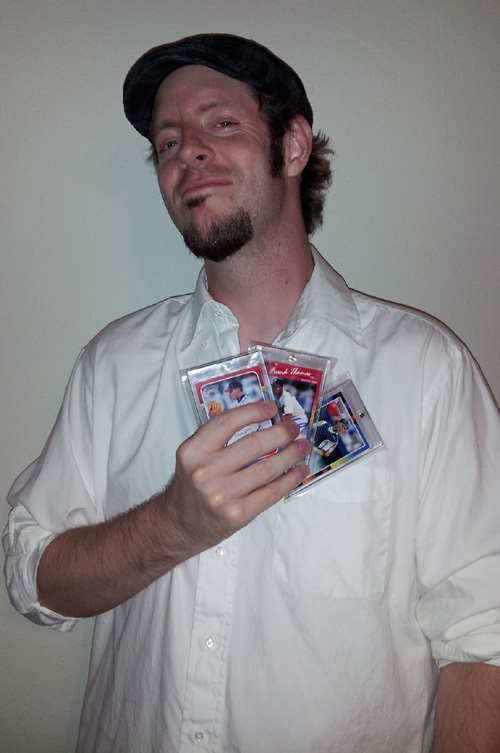 Friday afternoon, I was a few hours away from leaving my house to go to the card show in town. I got a call from my friend who was setting up. 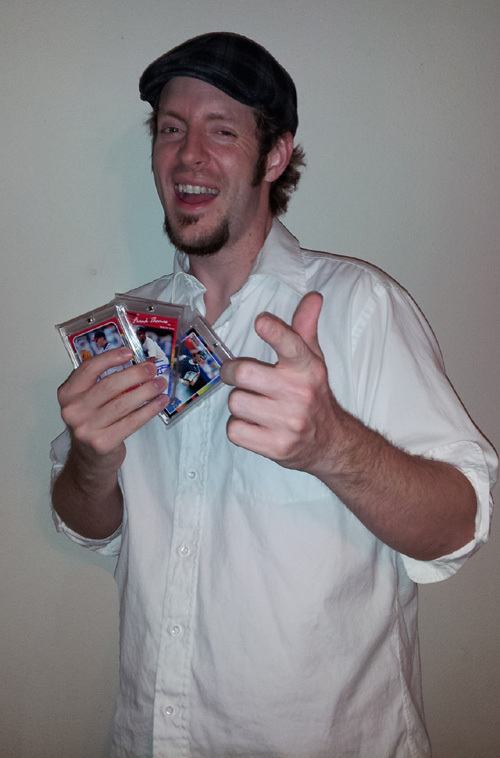 I had given him 69 of my unopened boxes of cards to sell for me. Thankfully, that wasn’t the case! 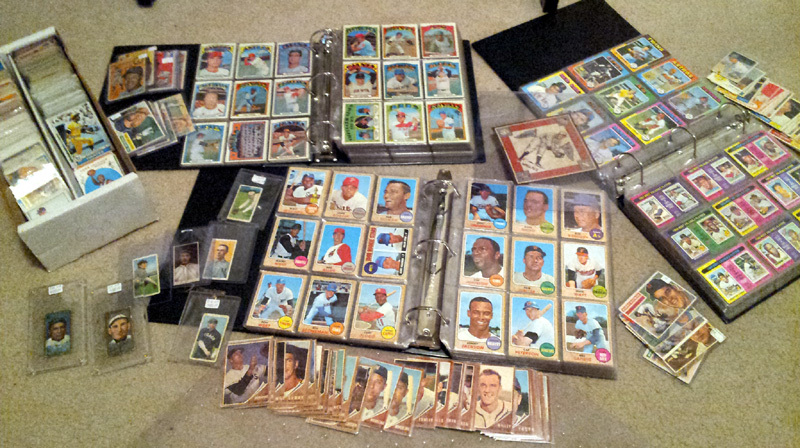 I scrounged up nearly everything I had and he bought pretty much everything I had on hand to fill up his cases. 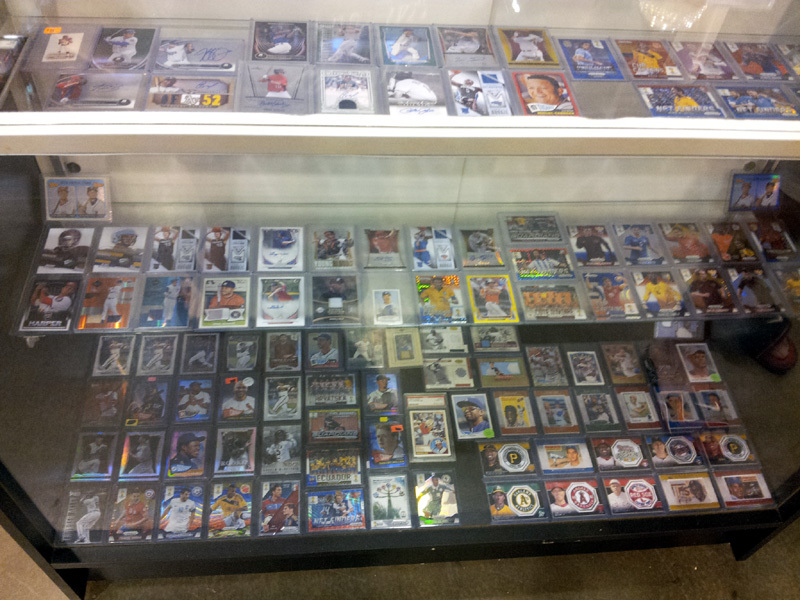 If you have been part of my flip quest, if you look closely, you may see some of your old cards in there! I may or may not have worn this to bed. Ah yes – I’m finally able see the seedy underbelly of the band of gypsy-like card show dealers that travel from all over to setup and pedal their goods. 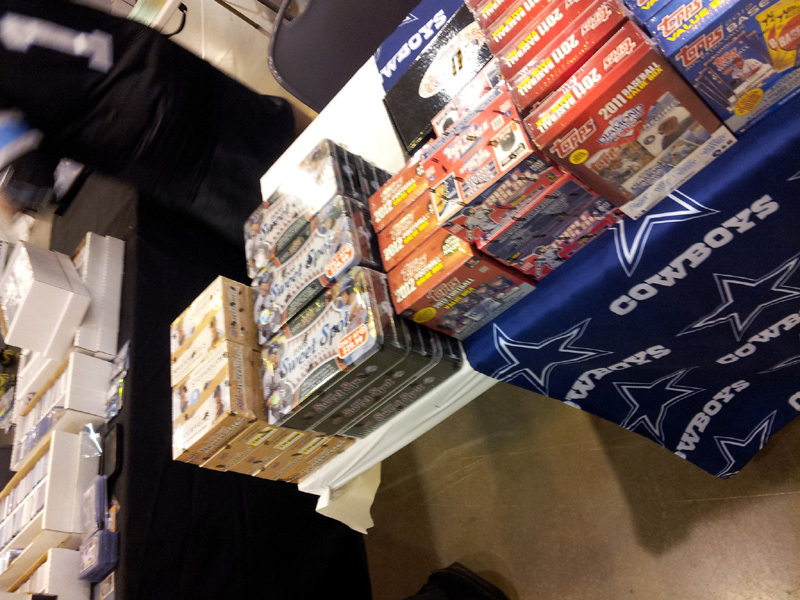 Someone walked up after I got there, and before the show started, someone grabbed about 29 boxes of stuff from me. 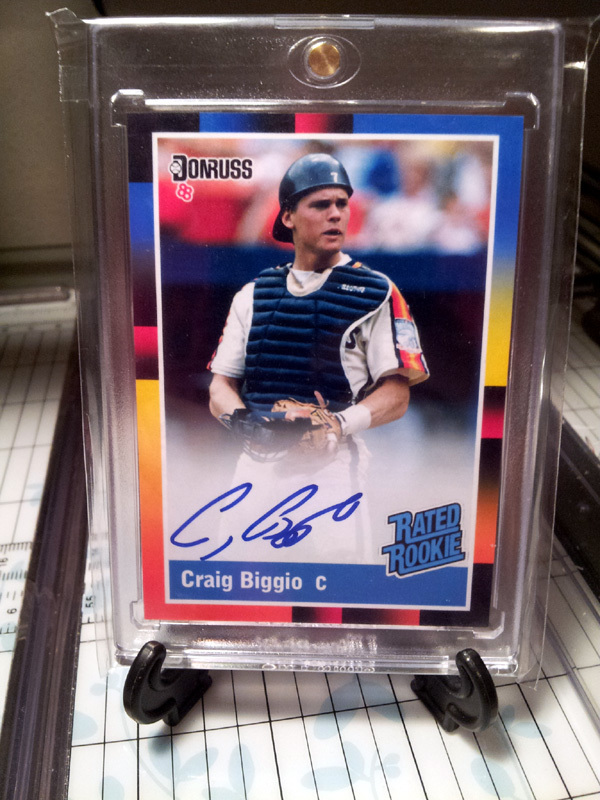 Smashing success from a wheeling and dealing standpoint, right? Wrong! 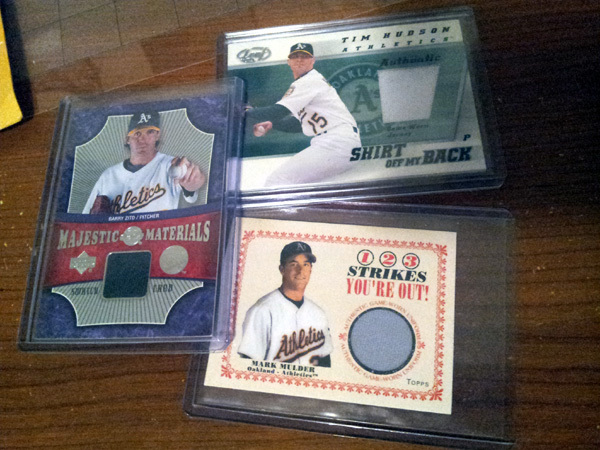 they cost all of $3 and are screaming at me to make a triple jersey of the moneyball era pitchers. 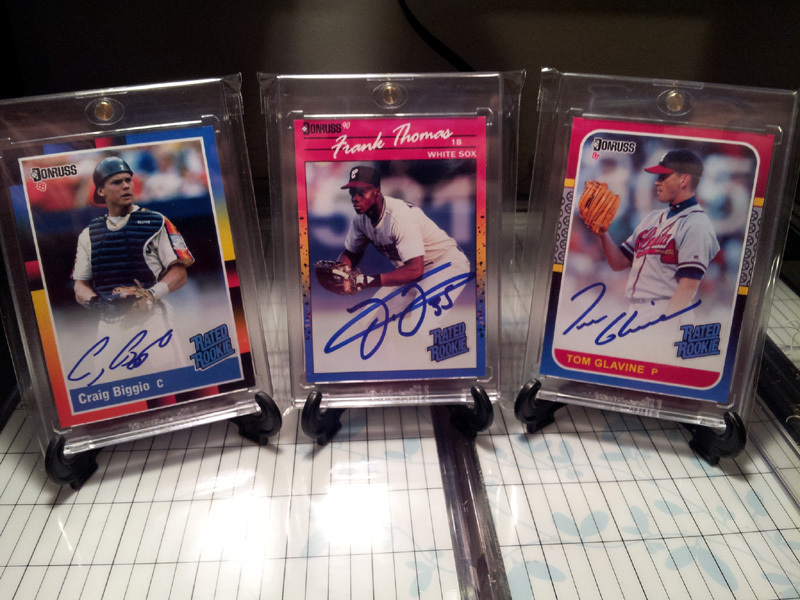 Some t205, t206 and t207 (love me some tobacco cards!) 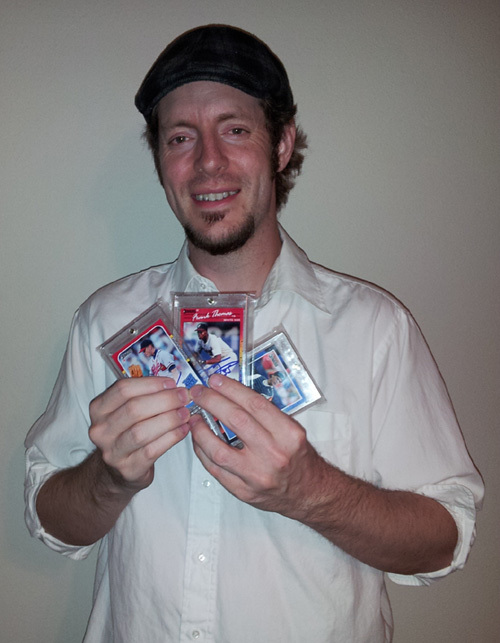 as well as a felt vintage card, a box of 50’s to 70’s stuff, and some BEAUTIFUL sets of ’68, ’72 and ’75 Topps. I’m happy with the purchase. I’m selling, of course! Thankfully though, all that had nothing to do with what made this show special. 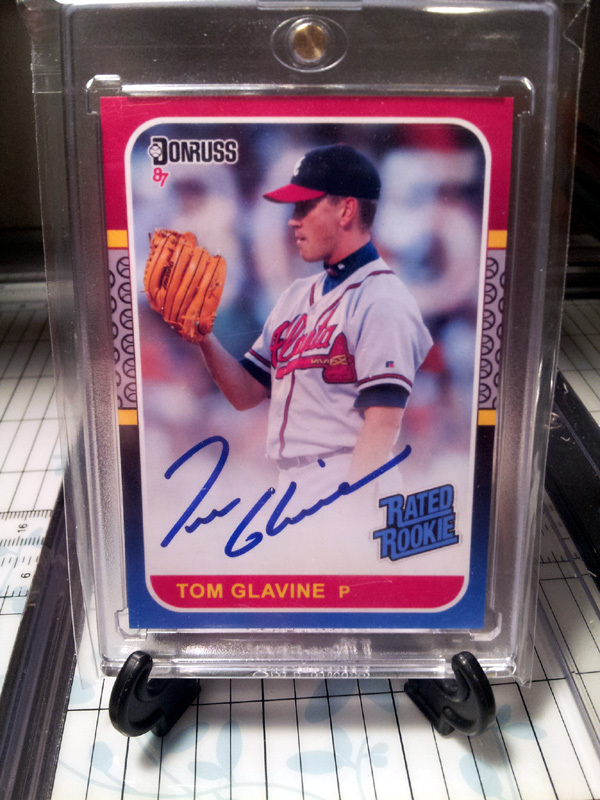 Saturday rolled around, and they called Tom Glavine’s name. YES!!!! It’s go time. I got in line, and was very happy to see him actually standing up and posing for a picture with his fans after he was signing! Such a cool thing. As I was rehearsing with my son on how to take a picture, it was our turn in no time. I think he did great! 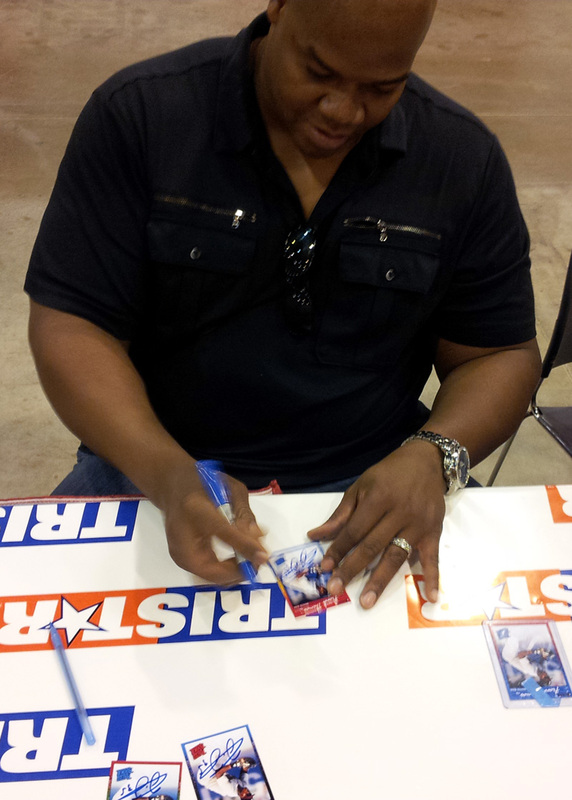 When I gave him the card to sign, I told him I made him one and gave it to him. 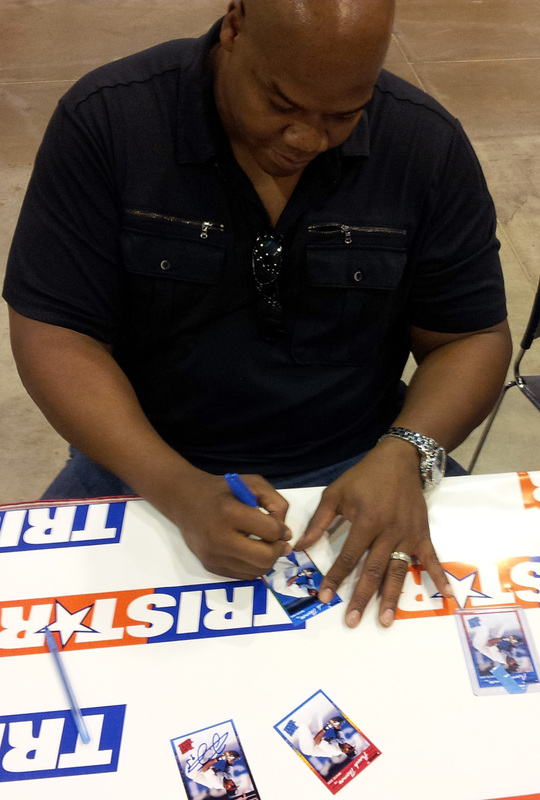 He thanked me, and off we went to get it authenticated. I think it came out fabulously … oh, and I LOVE the back as well. The hologram POPS! I went home after this a very happy camper. 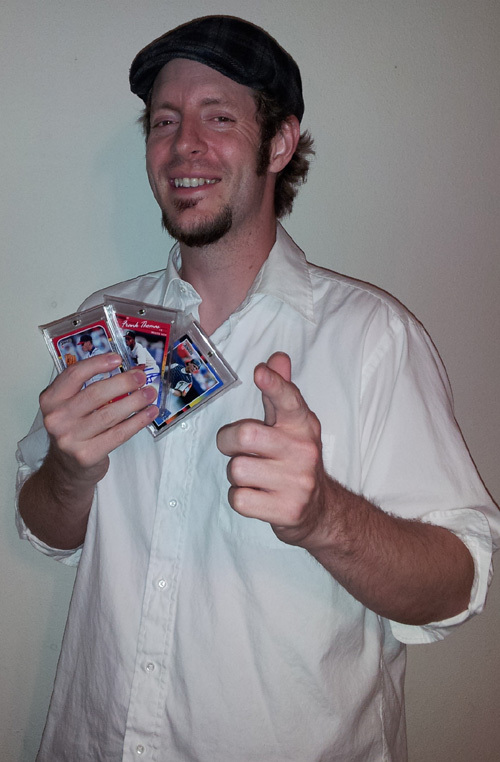 But not before I bought my tickets and authentication stickers to insure I was able to get Biggio and Thomas! Some dude named JJ Watt was sold out. Whoever he is. 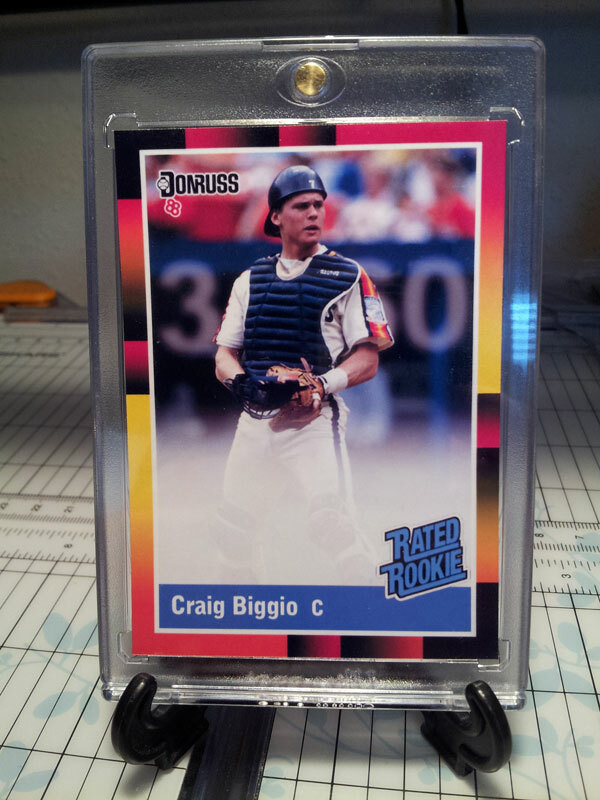 Ahhh, now to put the finishing touches on my Thomas and Biggio. Ahh, I’m out of ink and material. No biggie … that’s why I ordered backup. I stayed up until about 2am to wrap these things up, and didn’t get it done. It always seems that no matter how long I put into these projects, I am always pushing it to the last minute. I mean really, how long can one person really stare at two color gradient variations to determine which one looks better? I can answer that … HOURS UPON HOURS! 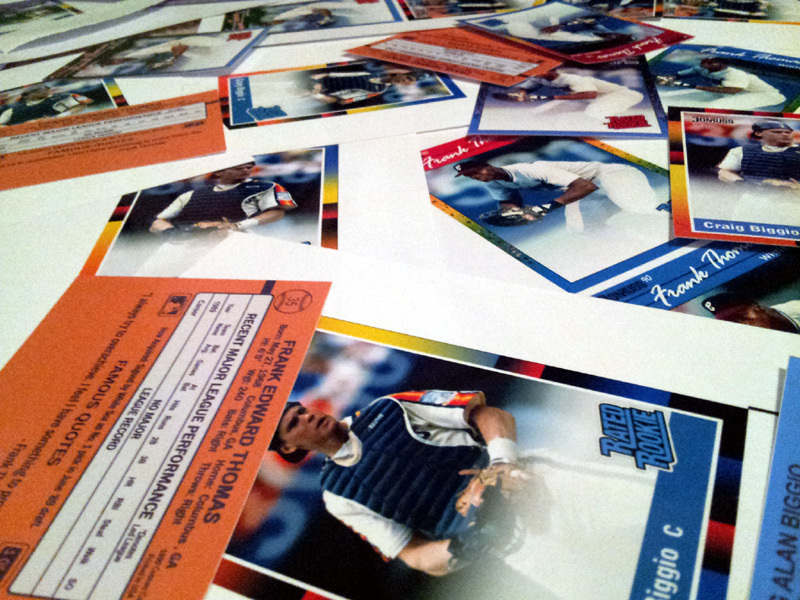 I woke up early the next morning, extra groggy ready to get my cards ready to be signed. I ended up going to several stores, and none of them have the material up to my standards. Of course they didn’t … they were local, and that would be too easy, right? THANKFULLY, I got it all sorted last minute. I packed up, and headed out. Here are all the mess ups. Sigh, this would actually make some pretty cool wallpaper, if it weren’t for all the stress it caused me! 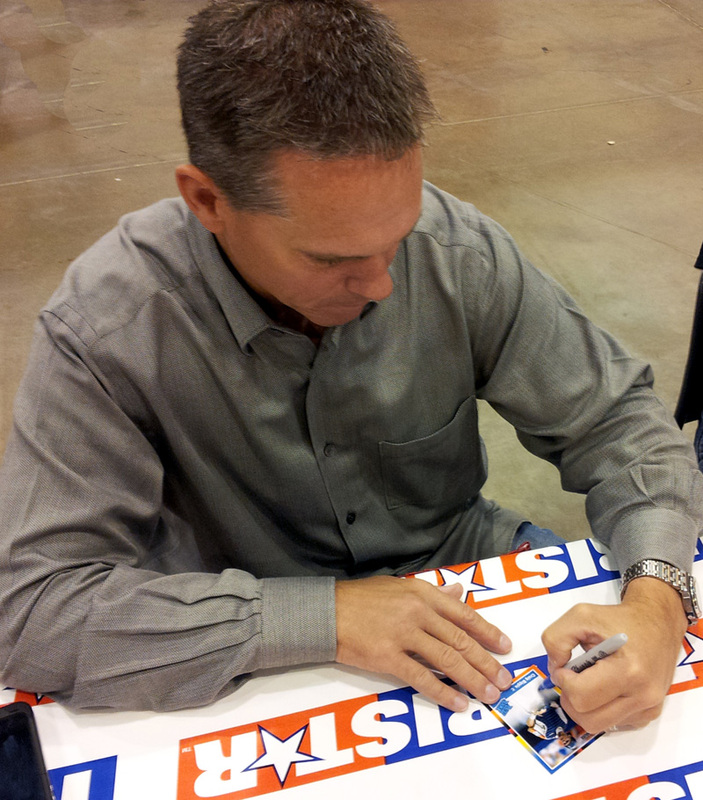 Shortly after I got to the show, they called Craig Biggio’s line to start getting ready. 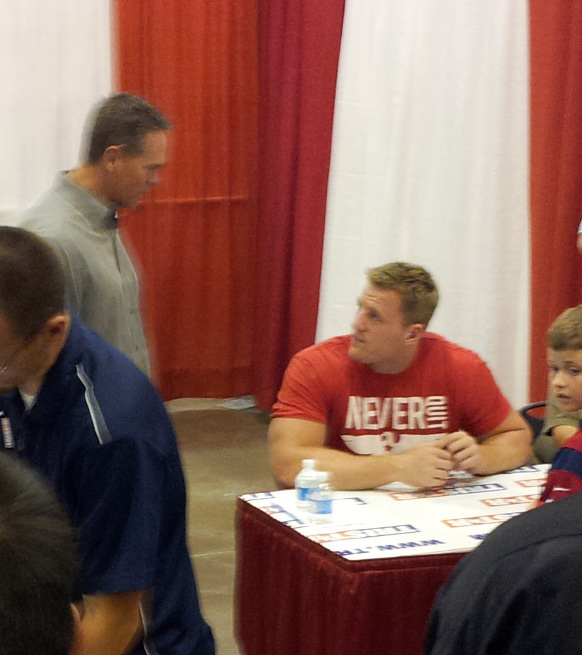 I did it, and was only maybe 15 feet or so away from that JJ Watt feller they keep talking about. 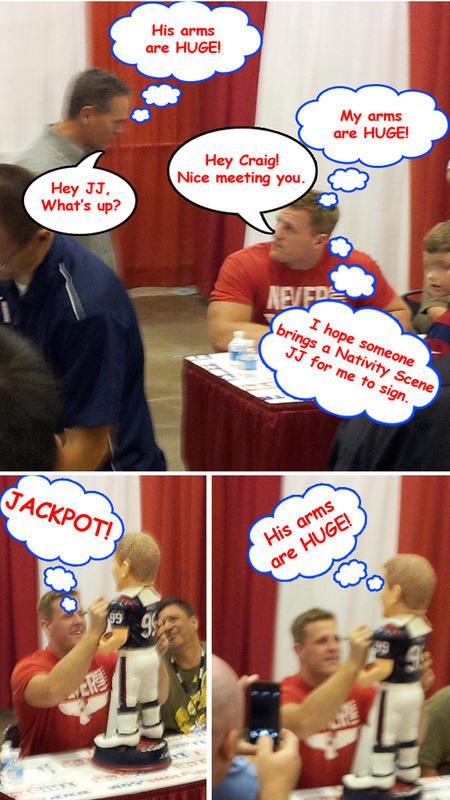 everyone was so eager to meet him. 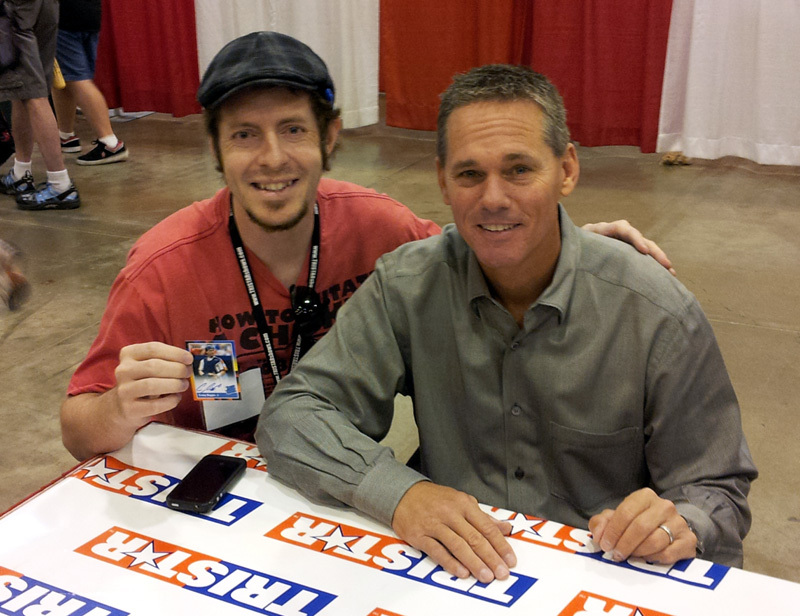 Finally, FINALLY it was my turn to go up to Biggio and have him sign my custom card. I gave him one as well, to which he thanked me. I was bummed because he was not taking pics with ANYONE in front of me. I mean no one. Surely that was the rule, because I mean … everyone has a phone … how could you not? I really wanted to get one with me. I just asked the dude behind me if he could hold my phone and take a pic. My plan was to just slide over by Craig and ask if I could take a quick pic with him while pointing to the dude that was holding my phone so it would only take a few seconds. Thankfully, he said yes and it worked out great! Well, I opted to go close up and go with a bit of blue instead. I’m happy I did! Last, but certainly not least, my favorite of the whole weekend. 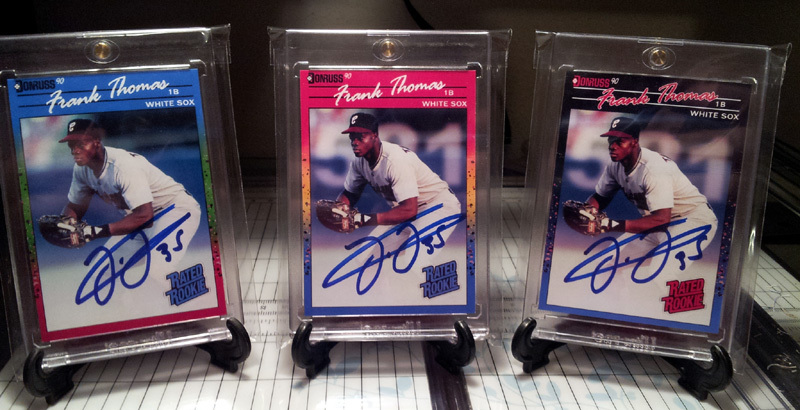 FRANK THOMAS!!! 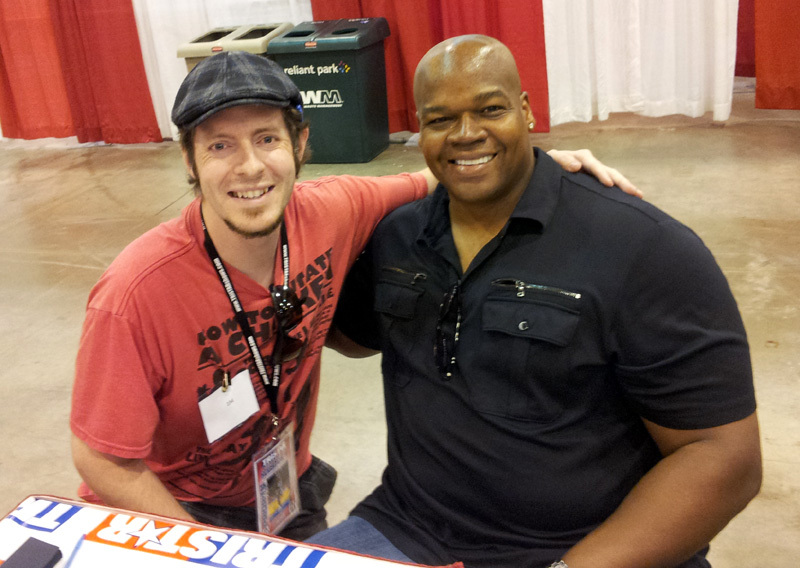 The Big Hurt. 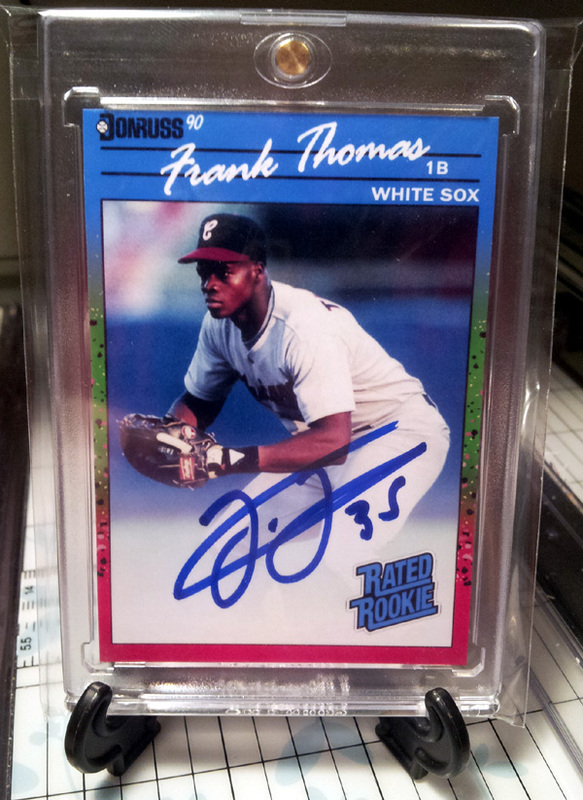 I was fortunate to have a few people pickup some autographs of him from me, so I was able to get in line and wait until Frank came out. Oh, by the way – I’m famous now. Someone that was in line asked if I was “the guy that makes custom cards”. I have officially made it, my friends! 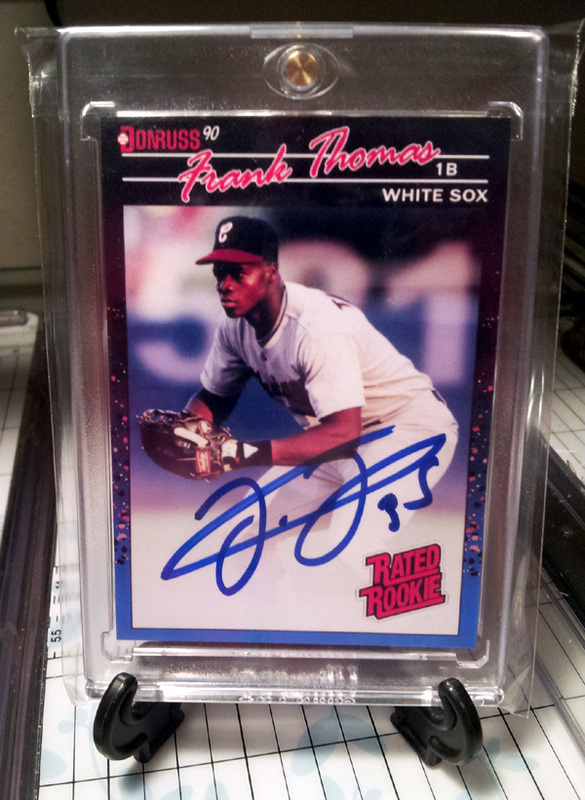 If I wasn’t a Frank fan before, I am now! I told him one of them was his, and he thanked me. When Frank suggests, you take it! 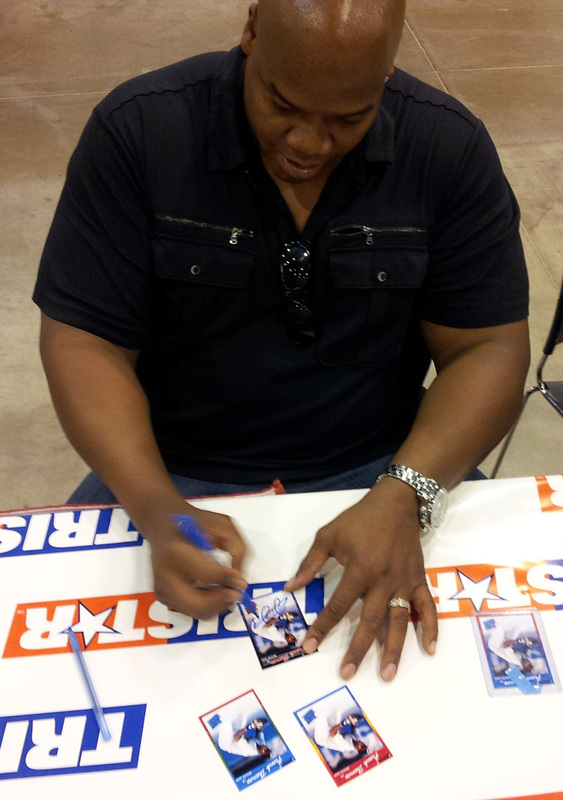 Okay, maybe that last part didn’t happen 🙂 No way in heck would I sign a card signed by the Big Hurt! Did Frank pose with me? You bet he did! Needless to say, I’m one happy camper, though the show itself didn’t have much to offer in the way of new inventory. 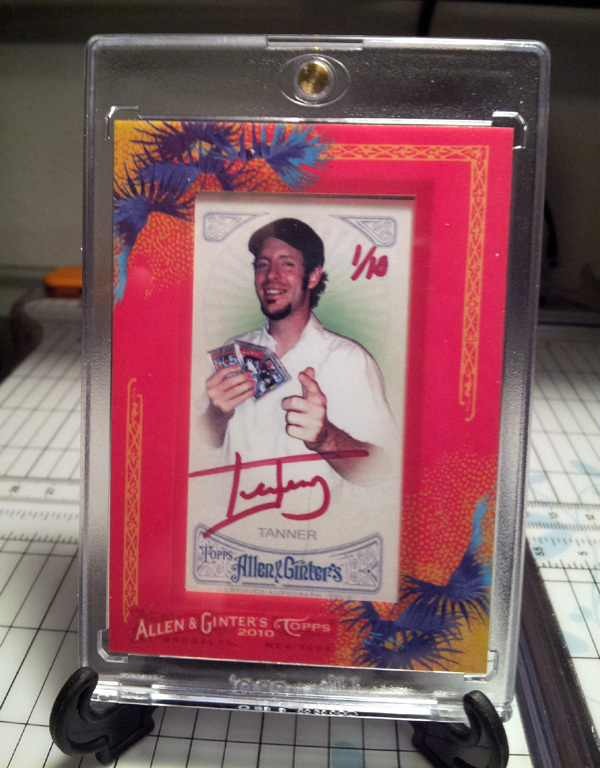 The authenticator did a double take on these cards “WAIT A SECOND … isn’t this card supposed to be all red?” Hahaha – yeah. 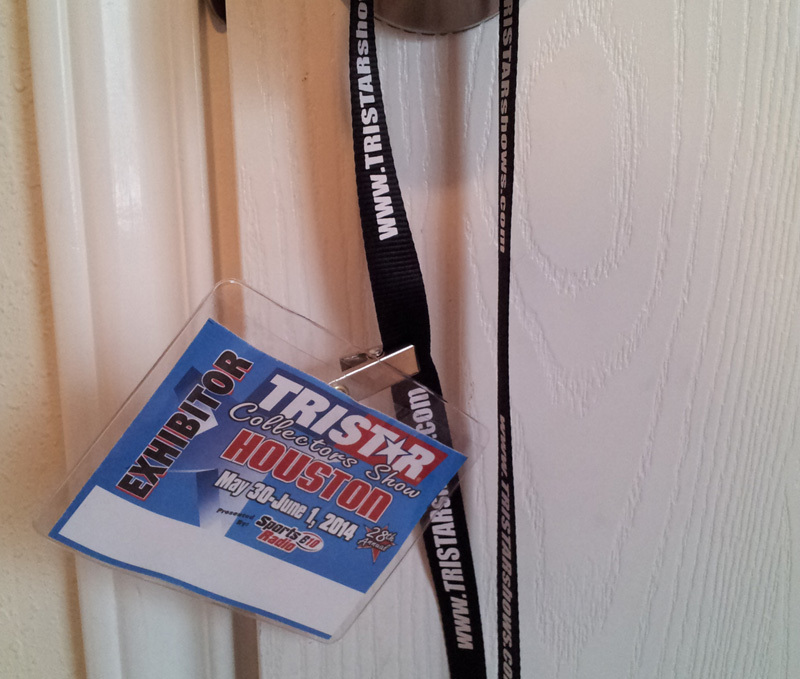 I look forward to seeing what the Tri Star Authentication code comes up with when they are entered in later this week! It took forever for this project, but I think it ended up a huge success, and a great memory for me, to boot. I am never going to think anything negatively ever again about someone who wants to shell out the extra dough to meet a player in person to get their autograph. So, after I got home, I kept thinking what could I do to wrap up this great weekend? Awesome !! And if you ever want to get rid of the Glavine you know where to find me !! 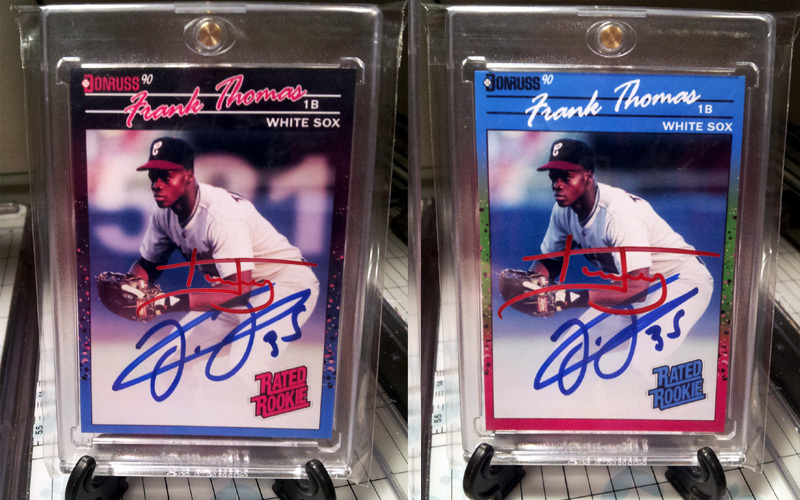 The black Frank Thomas looks amazing! Thanks! everyone seems to like that one the best. i like the one with the yellow the most myself. I am glad I did that black one though!